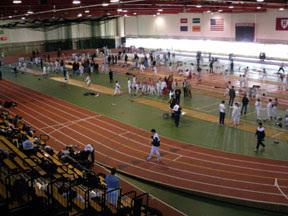 The following names are men and women that have been honored with First or Second Team All-Ivy distinction for Fencing. For the rundown as to how the All-Ivy distinctions are determined, please consult All-Ivy Explained. Video Highlights from the Round-Robins! Our trusty Canon digital camcorder was roaming the floor at the Ivy League Fencing Round-Robins on Sunday, February 25 at Harvard's Gordon Track. I was not able to get as much women's fencing video as I would have hoped, but we have some sound from Columbia All-American and 2004 U.S. Olympian Emily Jacobson. Congratulations to the Lions on the women's title, and to both Columbia and Harvard on sharing the men's title. Riding a perfect undefeated season, Columbia stormed through the Ivy Championship with a 13-0 record that saw the women win their seventh Ivy League championship in the program's history, and the first since 2003. Congratulations Columbia Women on a great showing at both the South and North Championships. Harvard: Tim Hagamen 3-0, Scott DiGuilio 3-0, Dan Sachs 3-0. Yale: Sebastian Cano-Besquet 0-3, Brad Broadhead 0-3, Nicholas Peterson 0-2, ___ 0-1. Harvard: Kai Itameri-Kinter 0-3, Long Ouyang 1-2, Enoch Woodhouse 3-0. Yale: John Gurrieri 2-1, Mike Aboodi 2-1, Andrew Holbrook 1-2. Harvard: Benji Ungar 2-1, Billy Stallings 0-2, Teddy Sherrill 3-0, Karl Harmenberg 0-1. Yale: John Beski 1-2, Michael Pearce 2-1, Steven Miller 1-2. Harvard: Alexa Weingarden 3-0, Samantha Parker 2-1, Eva Rosenberg 2-1. Yale: Katie Arden 0-3, Erin Frey 1-2, Farrah Kimovec 0-2, Jen Ivers 1-0. Harvard: Arielle Pensler 1-2, Anna Podolsky 2-1, Misha Goldfeder 3-0. Yale: Jennifer Cohen 1-2, Lidia Gocheva 0-3, Alisa Mendelsohn 2-1. Harvard: Maria Larsson 2-1, Precious Eboigbe 2-1, Jasmine McGlade 3-0. Yale: Rebecca Moss 0-3, Kristin Saetveit 1-2, Anne Nguyen 1-2.